Webinar: Extreme Water Levels on the Upper Great Lakes? Gone for Good? February 17, 2015. OTTAWA – The new climate proposal from Liberal Leader Justin Trudeau is a mixed blessing. It is great to finally hear a plan--unfortunately, it's not new at all. The federal government set targets and sat down with the provinces in 1998. It resulted in six years of meetings and little else. It too tried to both reduce emissions and increase oil exports. It failed. Government members of the Federal Standing Committee on Health are using their majority to force a very quick review of the Pest Control Products Act (the law that governs the licensing of pesticides in Canada). The 'review' will only consist of three brief sessions (about 6 hours) and will likely be over by the end of the week. Sierra Club only learned of the review last Wednesday and received an invitation to testify Thursday--very short notice indeed. Why the big rush? To get it over with quickly before the public knows what’s happening. One acute observer described government members on the committee as 'railroading' the Act. "This a clear attempt to protect the interests of international pesticide manufacturers while avoiding public scrutiny," said John Bennett, Sierra Club Canada Foundation. An Early Holiday Gift for New Brunswick! Sierra Club Canada applauds today's announcement of conditions for a fracking moratorium in New Brunswick. New Brunswick Premier Gallant announced tough conditions for the moratorium today, joining Nova Scotia in banning the practice. "New Brunswickers went to the wall to obtain a fracking moratorium and the conditions announced today indicate this law will address many of their concerns," according to Gretchen Fitzgerald, Campaigns Director for the Atlantic Canada Chapter, "The government has committed to cancelling existing fracking licenses, requiring proper consultation with First Nations, and addressing community and environmental concerns." TORONTO – The global campaign to ban neonicotinoid pesticides took a big step forward in Ontario today. The provincial government -- using its own pesticide control legislation -- will reduce the use of neonicotinoid pesticides by 80%. The Sierra Club Canada Foundation looks forward to participating in the public consultation in Ontario. “This is an essential first step and it was courageous,” said John Bennett, National Program Director, Sierra Club Canada Foundation. The Ontario government has been under tremendous pressure from multinational chemical companies like Bayer and Syngenta led by recently retired Conservative MP Ted Menzies. The companies stand to lose millions in sales of pesticides in Ontario. OTTAWA – Toxic laundry detergent pods that threaten children is not Canadians only choice. Canadians should know there is a safe, nontoxic and environmentally sustainable product invented and produced in Canada. Sierra Club Canada Foundation has a strategic partnership with Dizolve – a Canadian company that produces an environmentally sustainable and effective laundry detergent. OTTAWA – Environmental organizations are calling on Health Canada to stop approving systemic pesticides that are toxic to bees and threaten to interfere with ecosystem functioning. The most widely used group of systemic pesticides, neonicotinoids, has come under increased scrutiny as a contributing factor in large-scale bee die-offs and other harmful effects. 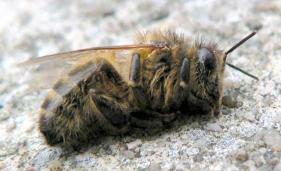 Now Health Canada is proposing to approve a new systemic pesticide, flupyradifurone. According to the government assessment, flupyradifurone may pose a risk to bees, non-target beneficial arthropods, and freshwater and saltwater invertebrates when used for foliar application. Flupyradifurone may pose a risk to birds and small wild mammals when used for soybean seed treatment. OTTAWA – Sierra Club Canada Foundation is calling on Ontario Agriculture Minister Jeff Leal to immediately ban the use of neonicotinoid pesticides on soybeans in light of an Environmental Protection Agency (EPA) study that concludes the bee killing pesticides provide little or no benefit to soybean growers.